Steamed brown Squishy Donuts Recipe Simple .Snacks with simple shapes and simple, but many people enjoy is donuts. 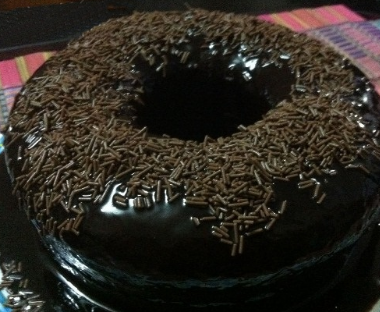 This cake has a distinctive shape that is rounded crate ring with a hole in the middle. Besides donuts are a practical food that can be the foundation to anywhere such as the provision of children when going to school or going to lunch when traveling. Not infrequently donuts enjoyed as procrastinators hungry because it is quite dense and the stomach as well as bread. Donat also has many variants like donuts with a variety of toppings or a donut with the material composition of potato, cassava or wheat. This time we will invite you to be creative in the kitchen of the house to make the donuts made ​​from flour but by steaming. Here are some list of ingredients used in the manufacture of steamed donuts and how to make it. Pour the flour, baking powder, milk powder, sugar, yeast and cornmeal dough into one container and then add the ice water and stir until the dough becomes smooth. Add back the dough with salt and white butter and continue stirring until the dough together with the additional material and texture becomes dull. Afterwards, enter the chocolate paste into the dough and knead again until evenly and let stand for about half an hour. Next batter is formed with a round to spare part, similar to the donut shape in general, and then save it in a container and let stand for a few moments. Prepare steaming and enter the donut that has been formed into the steaming and steamed cooked. While waiting donuts steamed cooked, prepare topping chocolate donuts cooking liquid form for dyeing and grated chocolate to cook or chocolate sprinkles meses. Lift and remove the donuts that have been steamed cooked and then dip some or all the donuts in chocolate cooking liquid and let cook and grated chocolate or chocolate meses on it. The steamed chocolate donut ready to be enjoyed. That's the easy steps in the manufacture of steamed chocolate cake donuts. Hopefully helpful recipe and happy baking! 0 Komentar Untuk "Steamed brown Squishy Donuts Recipe Simple"